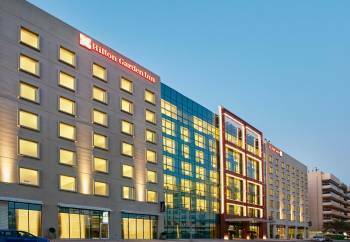 Welcome to the Hilton Garden Inn Dubai Mall of the Emirates, a new hotel just meters away from one of the largest shopping malls in the world. Our convenient location allows easy access to Sheikh Zayed Road and the Metro Station; offering fantastic connectivity to all major business districts and leisure attractions, including beaches, skydiving, golf courses and more. Downtown Dubai and the iconic Burj Khalifa at the Dubai Mall are only a 15 minute drive away.Start your morning with breakfast at The Garden Grille, or grab pastries and coffee from The Garden Café. Sip cocktails in The Garden Bar, and order room service any time of day. The 24-hour Pavilion Pantry™ has ready-to-cook meals, drinks, souvenirs and travel supplies. Unwind in the temperature-controlled outdoor infinity pool as the little ones splash around in their own kids’ pool. Book a massage, or visit the complimentary 24-hour fitness center. The hotel offers flexible meeting and event space and a 24-hour business center. Host a conference at our Dubai, UAE hotel with event and pre-event space for up to 60 guests. Choose from four flexible meeting rooms, all with natural daylight, 80-inch HDTV screens and complimentary WiFi. Finish a presentation or scan documents in the 24-hour business center.